Love sausage but trying to eat healthier? 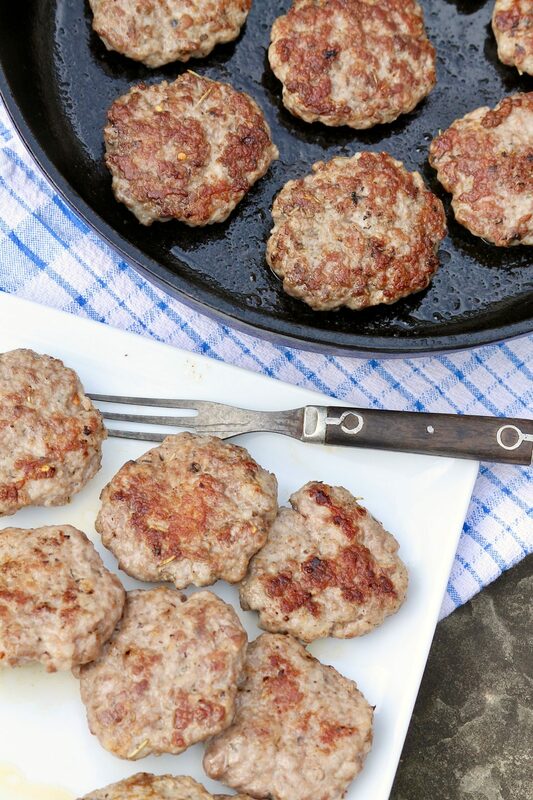 Ground pork and a short list of spices create a healthy alternative that tastes just like sausage and can be used in so many ways. We’ve all heard the claims that processed meat isn’t good for us. In a nutshell, processed meat is meat that has been preserved by curing, salting, smoking, drying or canning. So despite the delicious flavor of bacon, sausage, hot dogs and smoked ham, for example, numerous studies have linked to them to high blood pressure, heart disease and certain types of cancer. Specifically, the concern surrounds compounds called Nitrites, N-Nitroso compounds and Nitrosamines, which aren’t present in fresh meat. Of course, if you’ve read my blog for some time now, you know that I live by the “everything in moderation” mantra. So when I went to the Philadelphia Sixers game recently (go Joel Embiid!⛹‍♂️), I enjoyed every last bite of that mouthwatering hot dog. Seriously, the Philly sports venues have fabulous hot dogs! But day to day, I definitely limit my family’s consumption of these ingredients. One easy way to do that is by substituting the following mixture of ground pork and spices, which is a spot-on replica of Italian sausage. Prefer turkey or chicken sausage? No problem. Simply use ground turkey of chicken instead of the pork. 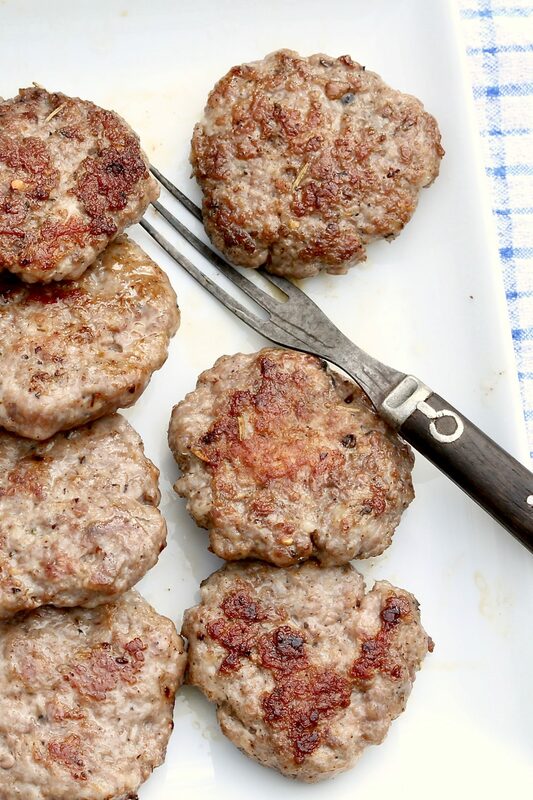 Then use this healthy alternative to traditional sausage any way you would use bulk sausage. Enjoy straight up as breakfast sausage or brown it and incorporate into soups, pastas, casseroles and more. Because some people prefer a hint of sweetness in their sausage and some do not, I’ve listed maple syrup as optional. In a recent side-by-side taste test, my family fell strictly in the savory camp, preferring the version without maple syrup. However, with the small amount added, the flavor difference is minimal and not overtly sweet. I love the hint of heat, yet these sausages are not what I’d classify as spicy. If you prefer very little spice, reduce the amount of red pepper flakes. If you like more, feel free to adjust upward. 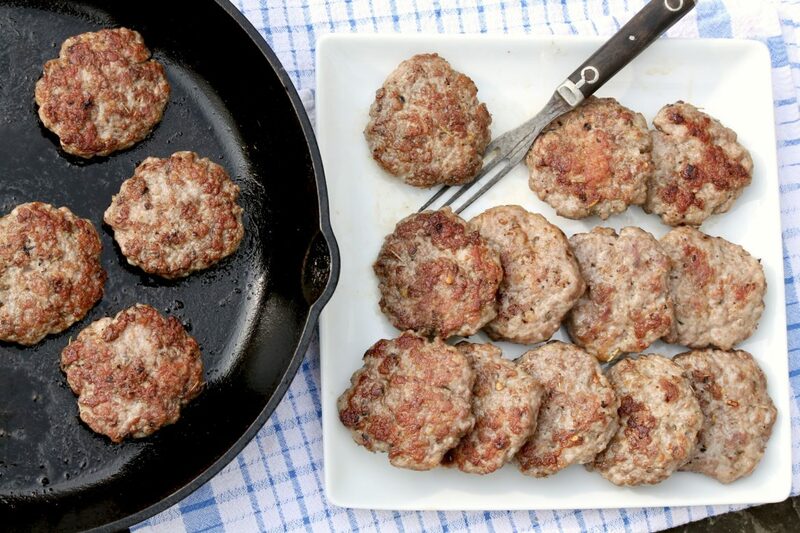 Conveniently, these sausages can be prepared in advance, and the uncooked patties can be refrigerated for up to two days or frozen. The cooked patties will keep in the fridge for about a week and may also be frozen. We love them for speedy breakfast sandwiches. Low-carb recipe coming soon! Ground pork and a short list of spices create a healthy alternative to sausage that can be used in so many ways. 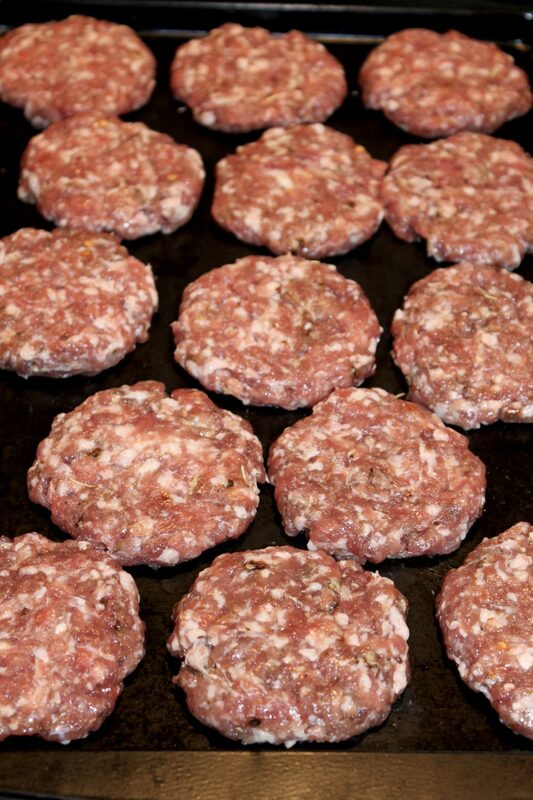 The easy recipe can be cut in half or doubled, and the patties freeze well whether cooked or uncooked. Sometimes, I add 1/2 teaspoon of crushed dried rosemary, too. In a small bowl, combine all of the seasonings (except the maple syrup, if using) and sprinkle the mixture over the pork. Drizzle the maple syrup over the pork, if using. Using your hands, mix the seasonings evenly into the pork without overworking the meat. Portion and shape the mixture into 16 (2-ounce) patties, or about 1/4 cup each. Make-ahead tip: At this point, you may cover well and refrigerate for up to 2 days or wrap and freeze for a month or so. Transfer to a paper towel-lined plate. The homemade sausages are delicious as a side dish or used in an egg sandwich. 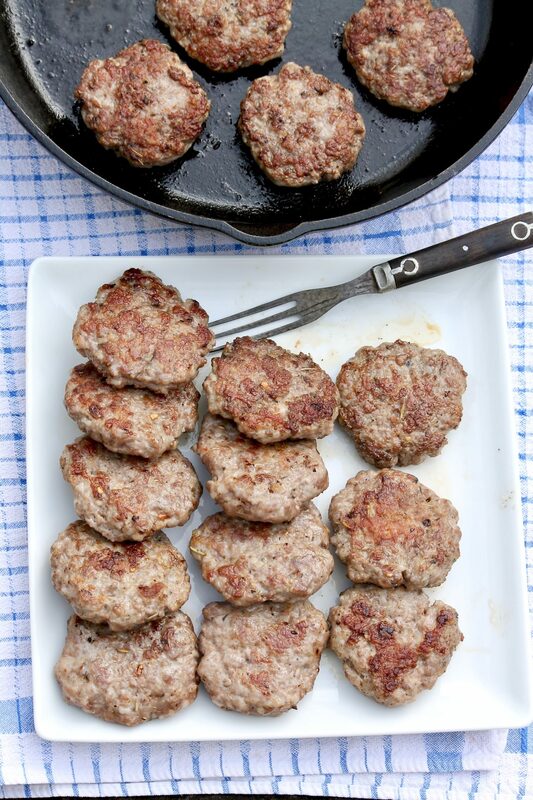 Tip: The ground pork mixture can also be used in recipes that call for bulk sausage. This amount of red pepper contributes a mild level of heat to the sausage patties. If you prefer very little spice, reduce the amount of red pepper flakes to 1/4 teaspoon (1/8 teaspoon if substituting cayenne pepper). If you like more, feel free to adjust upward. Helpful hint: To eliminate sticking, I rub a little oil on my hands before shaping the patties. I also like to use my kitchen scale to evenly portion the pork into 2-ounce patties. Then I press the patties into rounds that are slightly under 3 inches in diameter. You can also use a round biscuit cutter: place each portion of pork into the cutter, and press the meat down to fill out the cutter using your fingers. This will help to form patties of even size and thickness. I always make my own sausage patties as well . When I set out to do this , I use about six pounds of ground pork . Your recipe has all the same spices, all though I do add a bit of ground fennel . I place them on a sheet pan with wax paper and flash freeze, till I know they are not going to stick together, then put in labeled and dated containers. They will keep for up to six months . Thanks so much for mentioning fennel for those who may enjoy that addition and for your freezer tips. It’s so nice to have a stash on hand! I made these for my family and they were a hit! Tasted just like Italian sausage! Wonderful news, Mandy. Thank you for letting me know! Delish! Can’t wait to have it with french toast or pancakes. Or an egg sandwich.